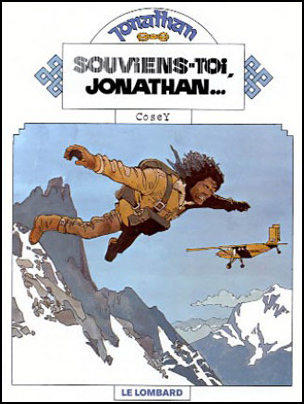 The first Jonathan Intégrale collects the first three stories of Jonathan, preceded by a dossier containing an interview with Cosey on the early years of Jonathan and an essay about Tibet. Let me start by saying that the album is a jewel. The album is slightly larger than the original albums, the paper is of a much higher quality (I compared the Intégrale with the original albums (dutch version), some 30 years old), the printing is much better (different colours and the black lines are perfectly aligned, which is rather exceptional in the original albums) and most importantly: the colours have been digitally corrected. Comparing the the Intégrale with the old albums, it is shocking to see how bad in fact the original editions are! Or, to put it more positive: how much progress has been made in 30 years! The colour correction (done by Nicolas Cardeilhac) has been excuted very, very well. The blues are more blue, some purples in the original edition turn out to be gray-blue (a colour difference also known from publications in Tintin Journal compared to albums), orange has become more red and less yellow – in short the contrast between colours has been increased, the colours are more saturated. Together with the much better printing quality (another example: the blacks are really black), the colour correction gives the drawings more depth, relief; it makes the drawings more alive, fresh and crisp. A great job of the Lombard team! The dossier is interesting, too. The interview with Cosey has no real ‘news value’ for ardent Cosey-followers, but now his statements about the early Jonathan years are available to a larger public. It is illustrated with mostly unknown sketches and photographs. The essay about Tibet (by Claude B. Levenson) is a little too political and too far off from the Jonathan stories, I think. But I understand that a collection like this cannot be made without some political statements about Tibet. 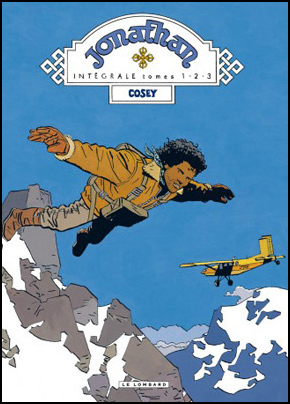 Cosey made his first trip to the Himalayas when he was working on the third story in this collection (Pieds nus…). In the dossier he admits that he didn’t make too much sketches or photographs during this trip (most photographs in the dossier are from later travels), which explains the somewhat loose connection of the documents in the dossier with the stories. Personally, I would be very interested in the transformation from (photographic) documentation into comic strip environment – I believe that part of the ‘Cosey magic’ is his ability to be very realistic and very poetic at the same time. The cover of the Jonathan Intégrale is a re-make of the cover of the first album edition of 1977… which was a re-make of the Tintin Journal cover of 1975. Compare the three covers! 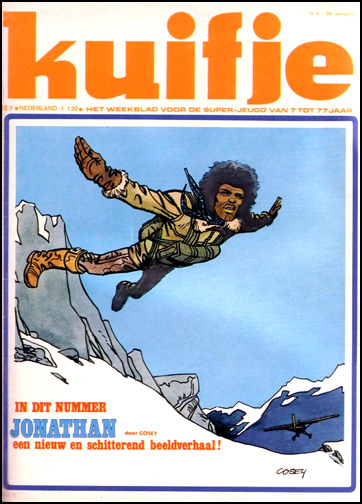 I have always liked the first cover because of the attitude of Jonathan (especially the stretched arms and hands) and of the aeroplane flying way from the viewer. In the second cover, and even more in the third cover, Jonathan seems more relaxed, which to me doesn’t match with the tension of the moment. If you compare the backgrounds of the covers two and three, you see the development in Cosey’s drawing towards more abstraction and suggestion. Which of the three covers do you like the most?